This Contour Folding Bed Wedge Cushion adds a gentle incline for your bedtop. 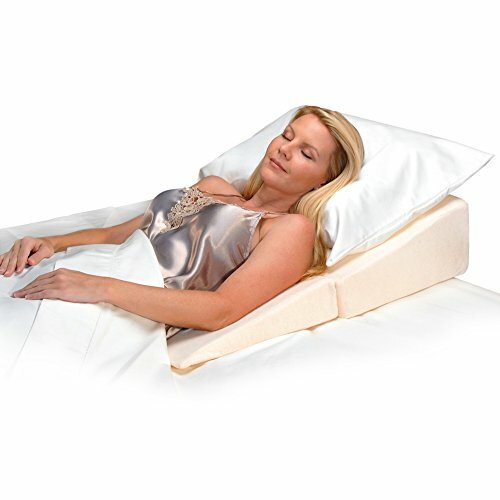 This full-size torso wedge supports the head and chest in an upright and angled position, aiding digestion, easing breathing and sinus pressure and soothing muscle tension while supporting the spine. The raised upper body positioning easing symptoms associated with acid reflux, GERD, heartburn and other digestive conditions. The soft velour cover is easily removed and machine washable. When not in use, the wedge folds in half for compact storage. Since the introduction of our first product in 1991, Contour Products has emerged as a recognized leader of specialty sleep, comfort and support solutions. Our products help to properly align the body for overall comfort and improved well-being.